Made-to-order, homemade pet food isn’t just for canines to enjoy. Finally, our feline family members can thrive on real food too. Just Food for Cats is now being served! 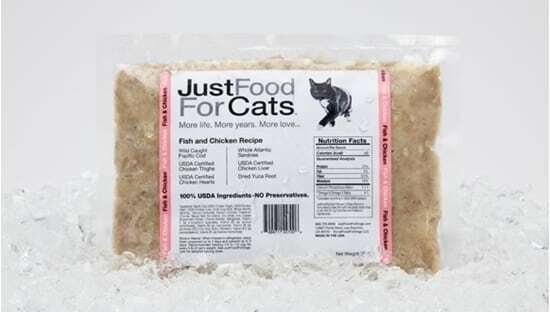 Lightly cooked, frozen cat food delivered to your door. What a thrill to see our friends from Just Food For Dogs at this year’s Western Veterinary Conference in Las Vegas. Tripawds Spokesdog Wyatt Ray dined on their culinary dog food masterpieces in 2013 and loved it. 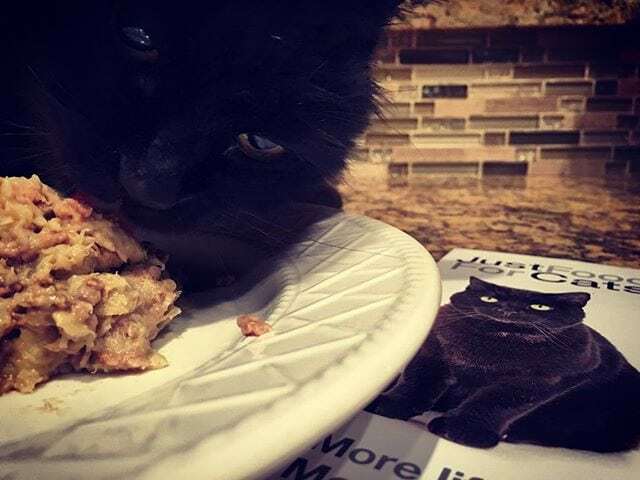 Since then the company has grown up quite a bit in preparation for wiser, smarter pet parents like us who are ready to switch from dry, bland commercial kibble to door-to-door frozen pet meals made just for dogs and now, cats. Why should you consider Just Food For Cats? Because now savvy veterinarians know that cats digestive systems aren’t designed to process carbohydrates and other junk in dry, carb-laden store-bought kibble. In this great cat nutrition article by Dr. Lisa A. Pierson, DVM of CatInfo.org, we learn the importance of choosing the right diet for felines. Just Food For Cats turns kibble on it’s head. The ingredients are as good as anything on your plate, if not better. You can watch it being made in Southern California. Just as it does for dogs, Just Food For Cats includes uses USDA-certified restaurant grade ingredients designed by eight on-staff veterinarians with nutrition expertise. The company’s kitchens are open to the public and all of their nutrition consultants are veterinarian-trained and ready to answer any questions for visitors. Multi-Vitamin & Mineral Blend compounded from 100% human grade nutraceuticals regulated by the FDA. 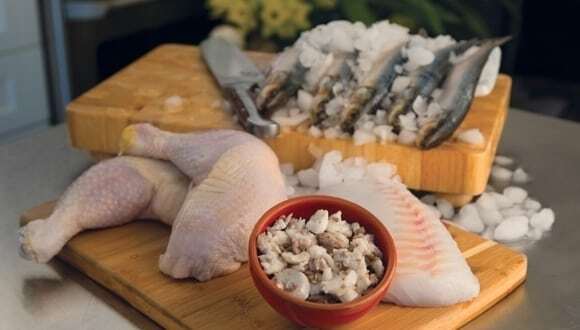 The lightly cooked, frozen fresh meal is grain and gluten free, perfect for adult felines. The high protein, hydrating recipe is ideal for cats with allergies or sensitive bellies, at 33 calories per ounce. Along with Salmon Bark, the company will be releasing more recipes soon. 18-year old Spencer loves it! Just Food for Cats is made fresh in five kitchens throughout Southern California, with more under construction along the West Coast. You can get FREE or flat rate FedEx shipping of Just Food For Cats (and Dogs) to anywhere in the U.S. Expect to see it in many veterinary clinics in the coming years. When you make the leap to Just Food For Cats (we hope you will! ), the company recommends starting a cat on the new food with no access to previous kibble. Some cats won’t recognize “real” food at first, but usually after four meals cats will start loving the taste of their real, home-cooked meals. If not, go back to their kibble temporarily and try again a few days later. “Remember, JFFC is healthier than anything processed in a bag or can, so persistence pays as your cat will thank you as he starts on the new whole food diet,” says JFFC.